Picatta, is possibly derived from an Italian word picchiare which means to pound, is a process, a method of preparing food, meat that is sliced, coated, sautéed and served in a sauce. though most people associate it specifically with capers, but it has more to do with the way the chicken is butterflied, flattened and the way it is seasoned and browned in butter or olive oil. A sauce is made using the pan drippings, lemon juice and white wine which are cooked together until reduced. After reduction, butter is stirred in to finish the sauce. Shallots or garlic and/or capers can be added with slices of lemon. In the United States, it is usually served with a starch, such as pasta, polenta, or rice. Personally I HATE capers so I opt to leave them out ALWAYS, but you be the judge. I also tend to avoid marjoram (just not a fan of that piney flavor in my food), but most picatta recipes call for it. Both capers and marjoram are used A LOT in Mediterranean food, I guess it is a regional thing! 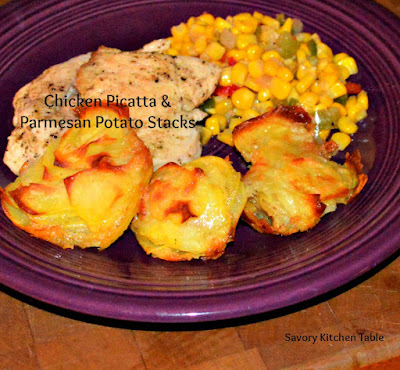 I normally make this with the Parmesan mashed potato recipe below, but the night I took the picture we had those cute Parmesan Potato Stackers that are all over the place right now. They'll be good for "company" dinners. One at a time place each chicken breast between 2 pieces of saran or wax paper. Work from the center gently pound each breast until flat, about 1/4 inch thick. In a shallow bowl whisk together the flour, salt and pepper. Coat each chicken breast with the flour mixture. Heat the butter or oil over medium high heat until hot. Add chicken cooking 3-5 minutes perside until cooked through and golden brown. Remove chicken to heated plate and keep warm. Add chicken broth to the skillet along with Worcestershire sauce nd cook until hot and well blended. Add in lemon juice and parsley, stirring to heat and combine. Serve over chicken with Parmesan potatoes. Bring potatoes to a boil until tender. Drain. Combine potato ingredients and beat until smooth.